Benchtop Resurfacing, Kitchens, Bathrooms, Laundries, Cabinet work, Granite, Tiling, Project Management. 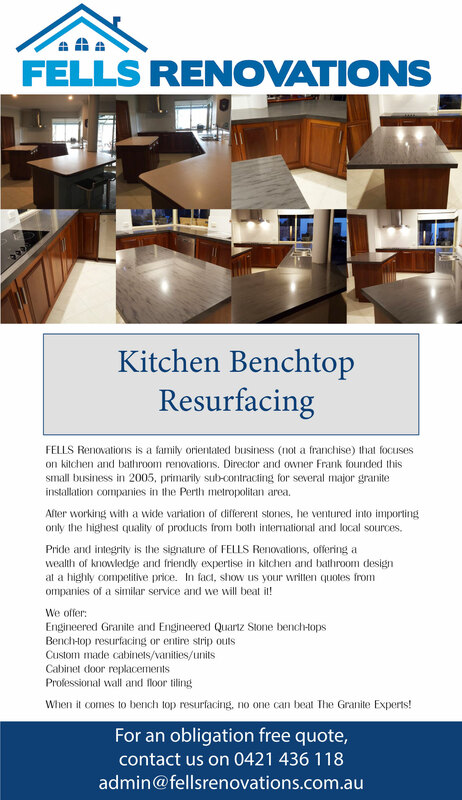 FELLS Renovations is a family orientated business (not a franchise) that focuses on kitchen and bathroom renovations. Director and owner Frank founded this small business in 2005, primarily sub-contracting for several major granite installation companies in the Perth metropolitan area. After working with a wide variation of different stones, he ventured into importing only the highest quality of products from both international and local sources. Pride and integrity is the signature of FELLS Renovations, offering a wealth of knowledge and friendly expertise in kitchen and bathroom design at a highly competitive price. In fact, show us your written quotes from ompanies of a similar service and we will beat it!